and the best prices in Tulsa, guaranteed! Tulsa Shutters and Blinds delivers on three promises: fast and precise first-rate customer service, high quality products sourced from the best brands, and the most competitive prices in the area. From homes to commercial and retail buildings, we work around your schedule and offer free temporary shades during installations for immediate privacy. For an estimate or other questions, you can reach us through our contact page or by calling John at Tulsa Shutters and Blinds: (561) 307-8245. Real wood, faux wood, aluminum. 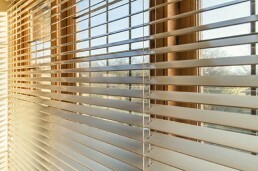 From 1”- 2 ½”, blinds never go out of style! Light filtering to blackout; roller shades, cellular, pleated, Roman…lots of choices that solve both design and function needs. The classic Plantation Shutter looks great with contemporary, transitional. or traditional styles. A lifetime structural warranty and great pricing makes these a terrific choice. Copyright Tulsa Shutters and Blinds. All Rights Reserved. Website designed and hosted by One of a Kind Solutions.